What Can You Do In Eight Weeks? My dear friend, Linda Baffa, reminded me this week that there are eight weeks left in 2014. She plans to explore one chakra per week in her yoga classes. I’m beyond excited, as chakras have become a passion of mine…But when she discussed what she wanted to do in the eight weeks left of the year, it dawned on me that I rarely, ever, really plan. I might set an intention, but that’s different. And so much can, and will, happen in an eight week period. What you consciously focus on, expands, right? Instead of just floating with the current, I might want to think about what specific areas and goals to magnify, instead of just trying to stay afloat with whatever life steers my way. Think about it. In eight weeks, you can fall in love. Have your heart broken. Pick up the pieces. Finish writing a novel. Lose 10 pounds. Lose your way. Find your passion. Help a friend. Find stillness. DeClutter. Travel to another country. Forgive someone. Forgive yourself. Earn a lot of money. Donate to the poor. Learn how to say no to those who ask too much of you. Detach with love when it’s necessary. Become a good listener. Discover how to listen to yourself, to your body, to the inner cues and intuitive voices. Learn something new. Do something that scares you. Start a project. Confront someone when it’s needed, and when it’s helpful. Eat more raw, organic food. Start flossing daily. Read a classic novel. Attend a concert. Go dancing. Stop drinking. Quit smoking. Run a marathon. Start playing with your children. Where do you want to set your course? What areas of your life do you want to put more emphasis on? Or is it just too much pressure to even think about? Will the current just take you, let you drift into unchartered waters without a conscious effort to steer? Maybe you are stuck in a place where currents don’t even flow: living with the same-ole-same-ole without the slightest change of scenery. And that can be really comforting sometimes. Or, like me, maybe each day, each week, fluctuates so much that there seems to be quick sand underfoot? Why am I meandering down this path? Well, I think it’s time to put some concerted focus and planning into my last eight weeks of the year. Sure, there’s still room for surprises, for serendipity, for coincidences, and hopefully for much-needed spontaneity. But at the same time, I need to steer a course, even if I don’t have an outlined, defined ending. It doesn’t have to be anything too rigid, or too unrealistic. It may just be as simple as the writer’s group I’m starting with trusted friends whom I can support, and who will support my writing in return. Yes, within eight weeks I will likely be finished with my novel (just one more chapter to go!). But at the same time, if I’m not, that will be okay. Life happens. If another child breaks an arm, or gets pneumonia, I’m thankful that I have the ability to take care of them. I love yoga and meditation for how it allows me to be become more flexible, to go with the flow more often, and to open up into trusting that I’ll still arrive at my destination—even if I don’t arrive as I had planned. Do I always go with the flow? No. (Especially not in love! But that’s for another venue!) But if I start a course, if I have a plan, it should help. I love the picture above for so many reasons. 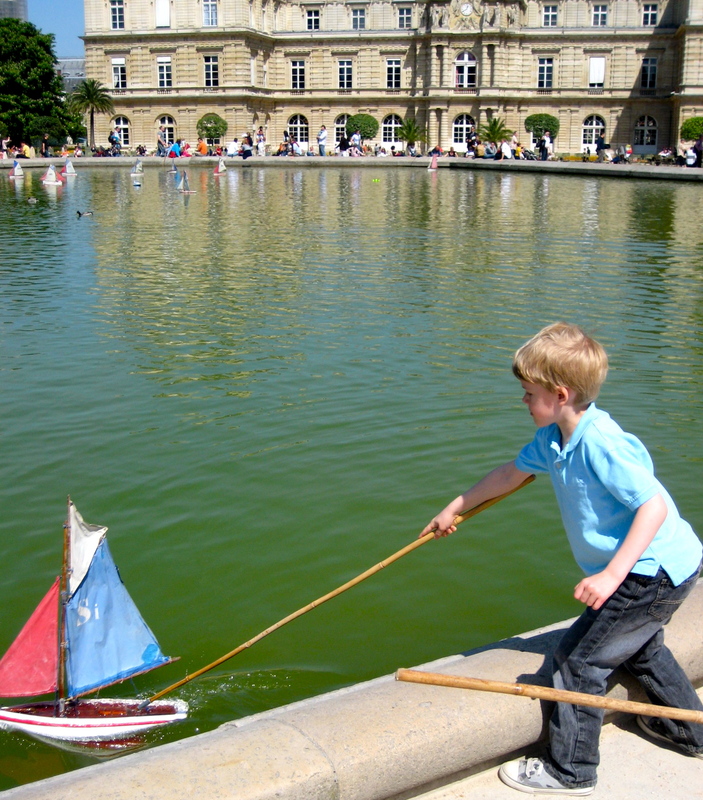 My son William became obsessed with the sailboats in Luxembourg Gardens the last time we were in Paris. I was five months pregnant with his little brother. It would be the last family vacation in Europe that we ever took. I’m so proud of that vacation. I found my voice, even through the waves of ever-present nausea. I demanded that we slow down and let a little boy, be a little boy. Our constant walking and museum going was driving him crazy. There was magic and importance in just sitting in a garden, in people-watching, in sailing a boat. This is what William and I had always done. While daddy was in meetings in various cities in Europe, I would stop and let William dig for worms in botanical gardens in Madrid, Paris, Lisbon. It was our thing. It was how I compromised. We’d go to a piazza in Venice and play with other children, and then later sit still and behave in an adult restaurant. It was my way of honoring him and me. Well, it reminds me that even back then, before I did yoga and meditated every day, I still knew the value of slowing down, of watching, of being, of playing. I even convinced his father to go to the dreaded EuroDisney instead of yet more museums. And you know what? I’m convinced it became one of their best memories together. And so with slowing down in mind, I tiptoe toward my eight week goals with the intention of still being able to find space. Of finding time. Of finding ways to just ‘be’ instead of rushing, demanding, stressing and getting distracted from what really matters. What matters to you? Focus on it. Magnify it. Write it down. Marinate in it. Imagine it coming true and give thanks for it. Work toward it, even if just for an hour every day. And have a wonderful journey to the New Year. This entry was posted in Divorce, Health/Wellbeing, WORDS and tagged creating space, goal setting, how yoga helps you set goals, manifesting your dreams, power of intentions, visualizing your dreams. Bookmark the permalink.